Contes et légendes du pays RAURAQUE. 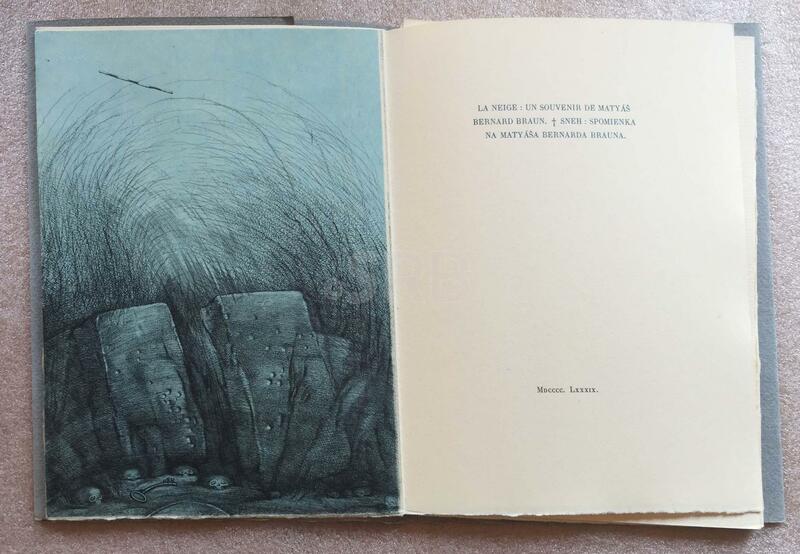 Illustrations originales de André BRECHET. 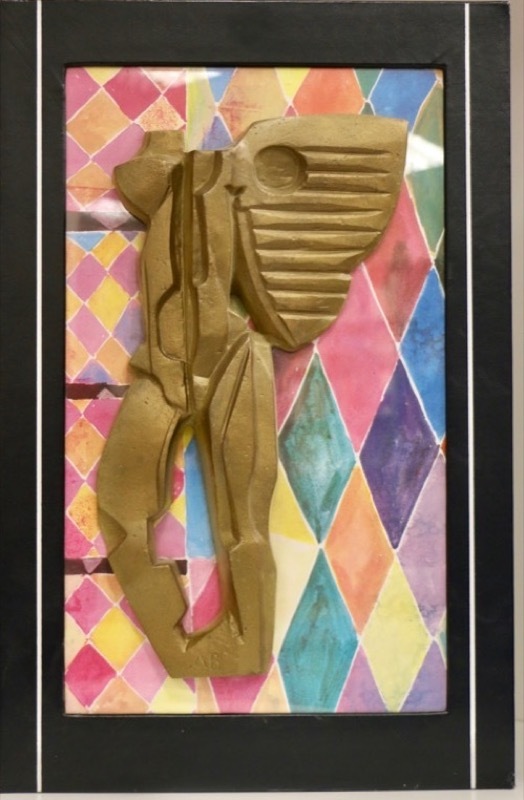 Editions d'Art Hifach, Château de Malessert Perroy, 1989 - In-folio en ff., sous coffret, recouvert d'une pleine peau noire, le 1er plat est vitré et montre, un décor de losanges polychromes, il est monté dessus, une sculpture moulée de l'artiste, le dos est titré en long en blanc, la couverture de l'ouvrage reprenant le décor polychrome du coffret, 179pp, les illustrations d'André BRECHET ont été tirées avec un passage pour chaque couleur sur les presses lithographiques des Ateliers SISA et ARTE à Paris, les rehauts à l'or liquide ont été exécutés à la main. Tirage à 200 ex. Un des 125 numéroté comportant l'état définitif des illustrations en une ou plusieurs couleurs se présentant comme suit: 8 à mi-page, 5 à pleine page et 8 sur double page. Très bel ouvrage aux illustrations contemporaines spectaculaires. New York, (1989). Very good. Single sheet measuring 8.5" x 11" approx. printed in black recto only in original envelope addressed to Ira Cohen in Heliczer's hand with simple line drawing at rear. Dampstain to lower portion of flyer. Folds for mailing. Envelope torn open at one end. Very good overall. 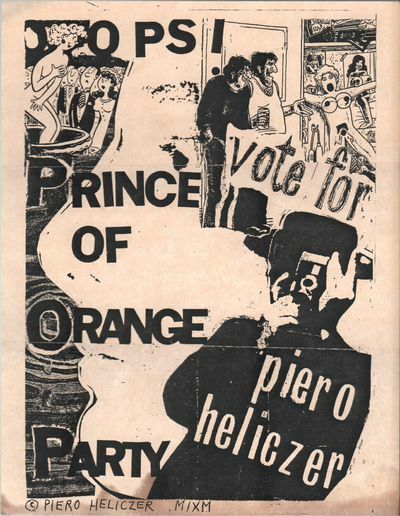 Helicaer-designed flyer for one "Prince of Orange Party" mailed by the artist to counter-cultural publisher Ira Cohen. A nice association between these two writers and mimeo revolution figures. Milano: Grafica Uno, , 1989. Ottimo (Fine). Acquaforte acquatinta a colori. 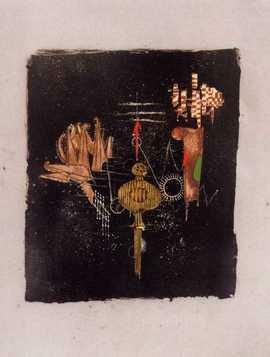 cm 64x50 (Foglio 90x70). . Ottimo (Fine). . 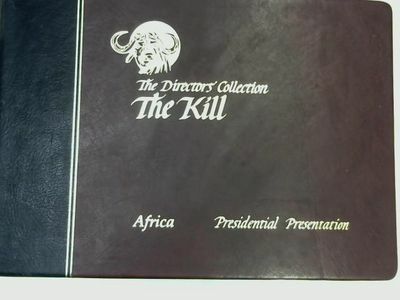 The Directors' Collection Limited, 1989. Hardcover. Good. 1989. Limited edition. 160 pages. No dust jacket. Large oblong boards in soft red full leather. Limited edition, no. 1241. 91 of 100 of this Presidential presentation. Very well preserved tissue guards to each of the colour prints here. There's some rubbing to the board edges and wear to the spine ends. One or two odd marks to front and rear boards with overall fading to the red leather.A solid and still attractive copy. 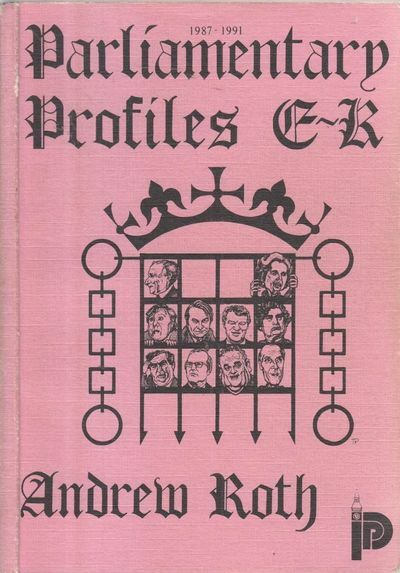 Parliamentary Profiles, 1989. Paperback. Used; Acceptable. Paperback; English language; a fair reading copy. Your book will be securely packed and promptly dispatched from our UK warehouse. All international orders are sent Royal Mail airmail. (Leamington Spa): Sixth Chamber Press. (1989). First. First edition. Six illustrations by R.B. Kitaj. Illustrated papercovered boards. 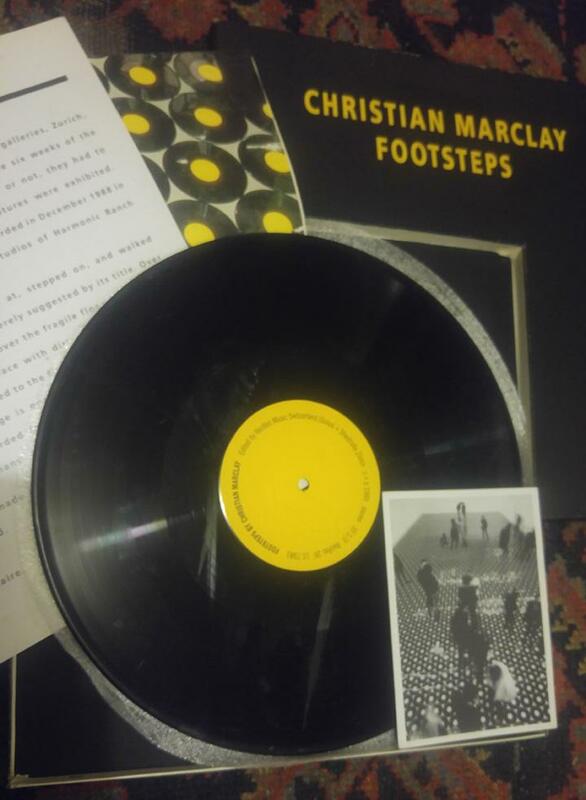 Very slightly rubbed, near fine in fine publisher's unprinted acetate dustwrapper. One of 200 unnumbered copies. 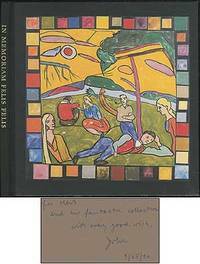 This copy Inscribed to Herb Yellin: "For Herb and his fantastic collection with every good wish, John 9/25/90." Herb Yellin was the founder and publisher of Lord John Press and the most frequent of Updike's fine press collaborators. He named his press after noting that the list of authors he wanted to publish all shared the same first name, chief among them John Updike, his favorite. Hub Fans Bid Kid Adieu became the press's first book in 1977 with 10 more to follow over the next 23 years. Yellin's friendship with Updike grew with each new limited edition benefitting his already enormous Updike collection, with Updike himself contributing copies of new editions of his books - often inscribed. In a 2010 interview with Yellin he noted that Updike "...liked that if anything ever happened to his own collection, he had my collection on the opposite side of the country." A notable association. .
Franklin Center: Franklin Library, 1989. First edition, Signed by Irving as issued. 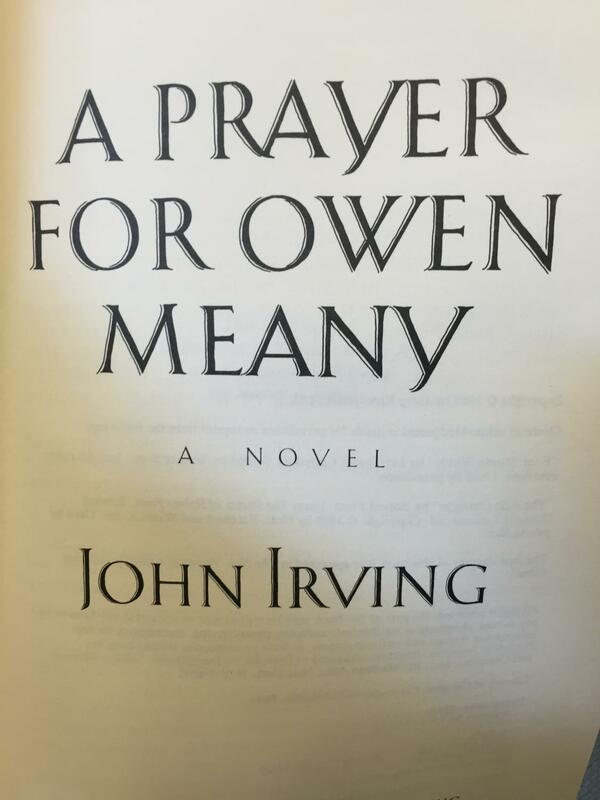 "Special Message" for this edition by Irving. Frontispiece by Cary Henrie. Publisher's announcement letter laid-in Includes Also includes the 6x9.5 inch illustrated cover card. Gilt-stamped leather-covered boards, all edges gilt, satin pagemarker. Issued without dustjacket. 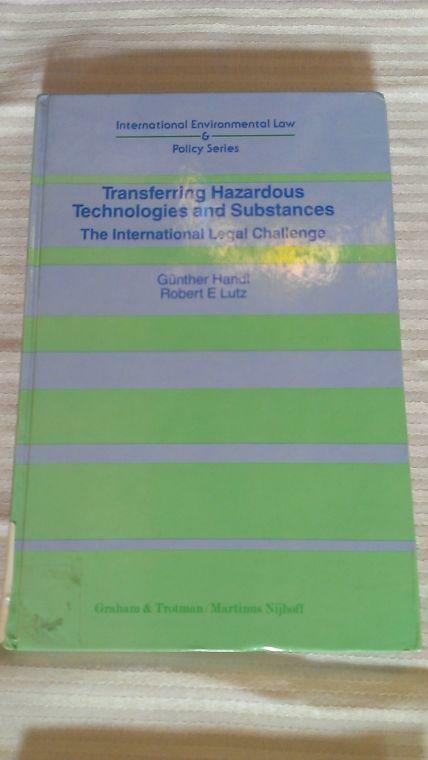 An unread copy in Fine condition.. Signed by Author. First Edition. Hardcovers. 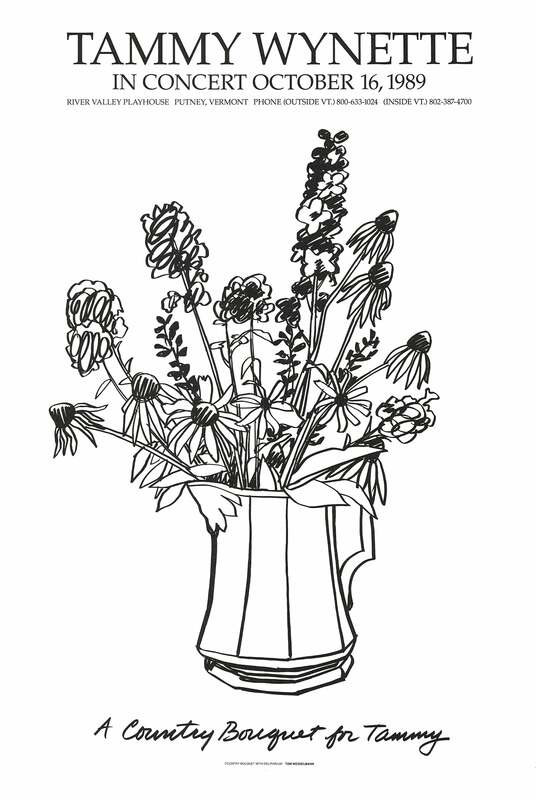 8vo - over 7¾" - 9¾" tall.The images are of the book described and not stock photos. 1989. Legno originale per xilografia, inciso sui due lati, di cm. 36 x 28, in cirmolo (pino cembra) di filo. Firma in basso. Seattle, Wash: Henry Art Gallery, University of Washington, 1989. 4to. 60 pp., 78 illustrations in color, chronology, selected bibliography, chronological list of illustrated works. 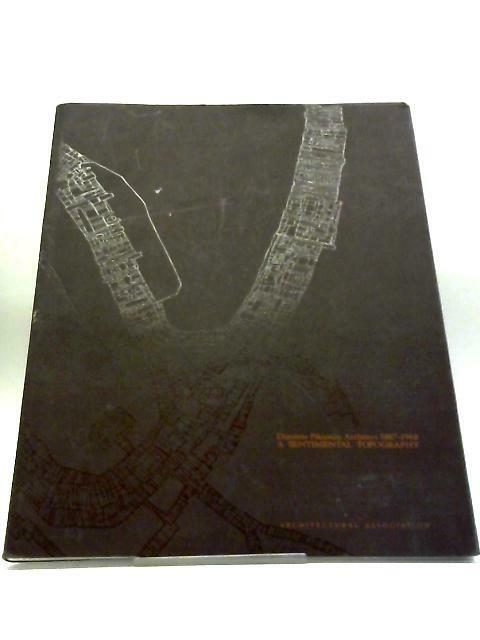 Catalogue for exhibition held November 15, 1989-January 7, 1990. 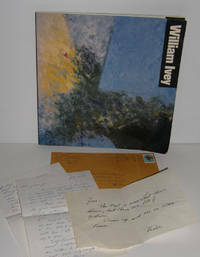 Presentation copy to Jim and Jean Eakle, accompanied by a two-page ALS from Helen Ivey to Jim and Jean Eakle dated Jan. 13, 1996 in original envelope, and an undated one-page ALS from William Ivey to Jim Eakle. 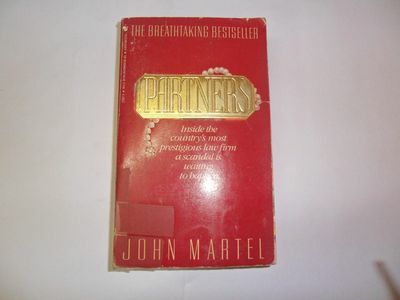 Book is very good in wraps with curled and bent corners, ALS material very good as well. San Francisco: James Linden, 1989. First separate edition. Mundy, Michael. Original cloth, labels, 9 x 11 inches. 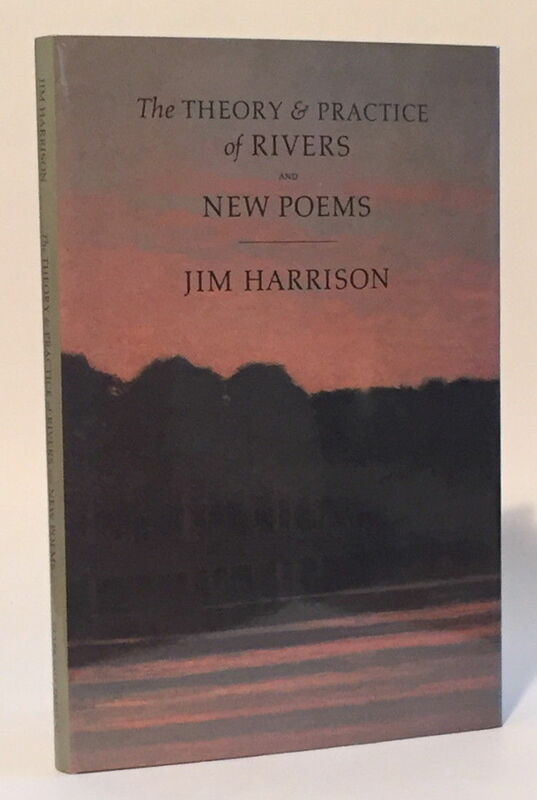 One of ten de luxe hardbound copies, from a total edition of 87 printed by Julie Holcomb on Rives Heavyweight paper. Text is "Where It Is" from "Always Coming Home," by Ursula K. LeGuin. Three original photographs by Michael Mundy, mounted, signed, and bound into the book. 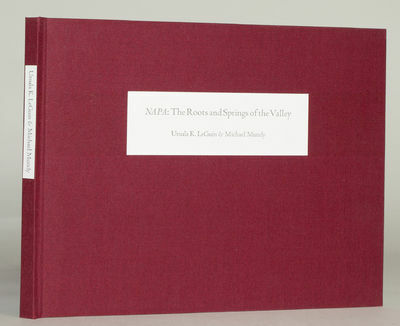 The de luxe copies include an additional photograph of the Napa Valley signed by the artist, archivally mounted and inserted in a pocket on the back cover. Fine. U.S.A.: Churchill Livingstone, 1989. Complete 2 volume set. These are ex-university library books in library bindings. Otherwise, the hardcover books are good plus with shelfwear, bumped corners, some wear to the bindings and a bit of underlining in pencil. There are no dust jackets. A nice example of a very scarce set.. Hard Cover. Good. Ex-Library. San Francisco: James Linden, 1989. Original cloth, labels, 9 x 11 inches. 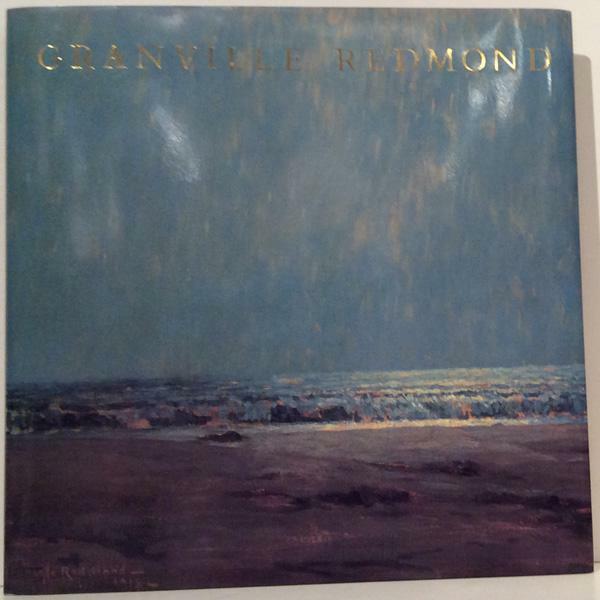 One of ten de luxe hardbound copies, from a total edition of 87 printed by Julie Holcomb on Rives Heavyweight paper. Text is "Where It Is" from "Always Coming Home," by Ursula K. LeGuin. Three original photographs by Michael Mundy, mounted, signed, and bound into the book. The de luxe copies include an additional photograph of the Napa Valley signed by the artist, archivally mounted and inserted in a pocket on the back cover. Fine. London: Alecto Historical Editions, 1989. , 15 engraved plates after Bauer, in two states, sepia and bound, or hand-coloured (by Karen Lightfoot or Helen Wellard) and unbound. 624x490mm. HB. Fine. Original cloth-backed marbled boards, the coloured plates loose within window mounts, all contained within a single green morocco-backed Solander box, by Aquarius.Number III of 35 copies. "The 15 plates which make up this publication were stipple-engraved on copper by Bauer between 1806 and 1813 after his watercolours drawn from nature... Both plates and watercolours are now in the collection of the British Museum (Natural History)... These new impressions, the first to be taken from the original copperplates since Bauer's 1813 edition, were printed a la poupee and hand-finished in watercolour... Modern names and place of publication have been researched by Dr. Christopher Humphries.Only three parts of the original work were published, each limited to fewer than 50 copies, comprising a title, dedication (to Sir Joseph Banks), 3 pages of text and 15 plates. (Leamington Spa): Sixth Chamber Press, (1989). (Leamington Spa): Sixth Chamber Press. (1989). First. First edition. Six illustrations by R.B. 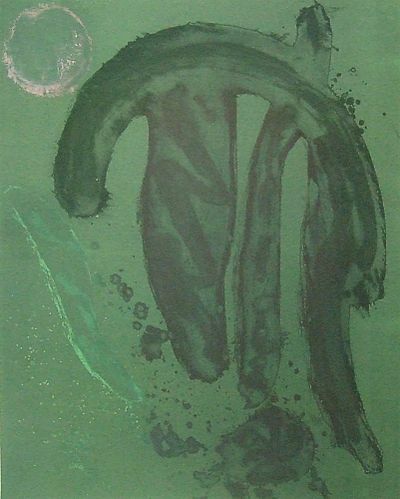 Kitaj. Illustrated papercovered boards. Very slightly rubbed, near fine in fine publisher's unprinted acetate dustwrapper. One of 200 unnumbered copies. This copy Inscribed to Herb Yellin: "For Herb and his fantastic collection with every good wish, John 9/25/90." Herb Yellin was the founder and publisher of Lord John Press and the most frequent of Updike's fine press collaborators. He named his press after noting that the list of authors he wanted to publish all shared the same first name, chief among them John Updike, his favorite. Hub Fans Bid Kid Adieu became the press's first book in 1977 with 10 more to follow over the next 23 years. Yellin's friendship with Updike grew with each new limited edition benefitting his already enormous Updike collection, with Updike himself contributing copies of new editions of his books - often inscribed. In a 2010 interview with Yellin he noted that Updike "...liked that if anything ever happened to his own collection, he had my collection on the opposite side of the country." A notable association. .
Pittsburgh: Carnegie Mellon University Press. 1989. First. 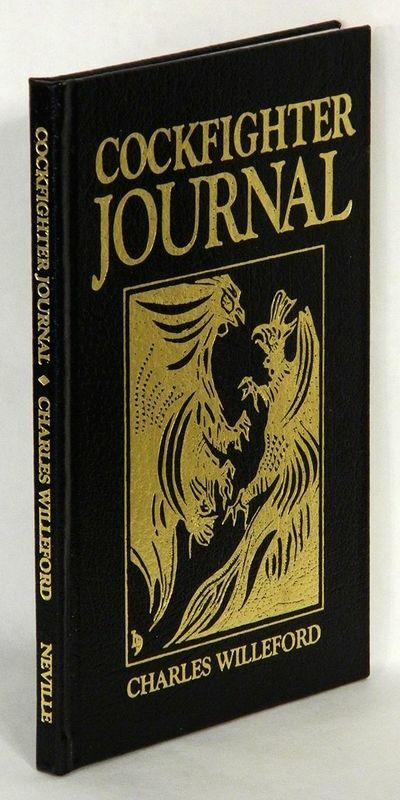 First commercially published edition, preceded by a rare limited edition. Illustrated wrappers. A small dampstain to the bottom corner of the pages, else a near fine copy. 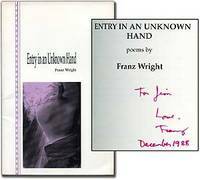 Inscribed by Wright in December 1988, apparently prior to publication, to another poet and close friend. .
NEUE ANWENDUNGEN FLUORESZIERENDEN LICHTS mit DIAGRAMMEN, ZEICHNUNGEN und DRUCKEN von DAN FLAVIN. Baden-Baden / NEW USES FOR FLUORESCENT LIGHTS with DIAGRAMS, DRAWINGS and PRINTS from DAN FLAVIN. 26.2. - 16.4.1989, Staatliche Kunsthalle. SIGNED, INSCRIBED and DATED by DAN FLAVIN on the title page: "for all our Nurse 'Jackie' / with best regards and / wishes to you. Dan Flavin 1990". 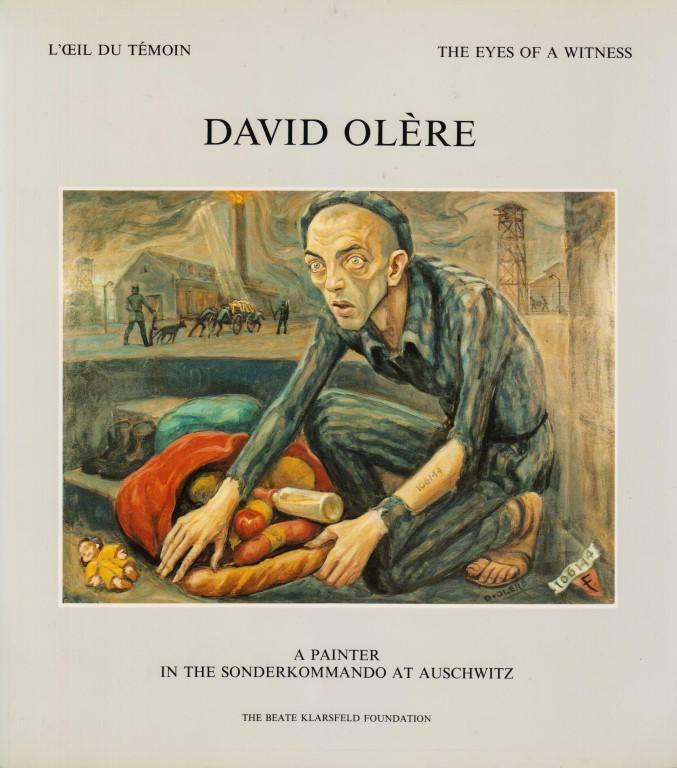 Artist's Monograph / Exhibition Catalog for the Exhibition that took place from 2/26/1989 through 4/16/1989 at the Staatliche Kunsthalle Baden-Baden (Germany). Published by the museum, 1989. 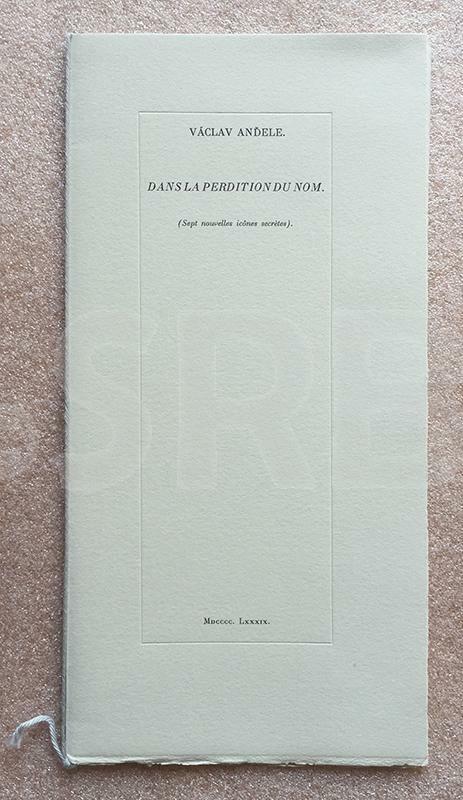 Softcovers, French folds, 9.25 x 11.5 inches, 168 pages. Text in German and English. Illustrated throughout with photographs of Flavin's neon installations, and with his drawings and diagrams. VERY GOOD condition, slight crease to the very top of the spine, a tiny crease to the upper corner tips of some of the early page tips, light toning to the page edges, overall tight, bright, clean and unmarked. A solid, lovely copy. SIGNED and INSCRIBED books by DAN FLAVIN are SCARCE. You can read a lot about the artist DAN FLAVIN on Wikipedia and elsewhere on the Internet. INTERNATIONAL BUYERS PLEASE NOTE: This is book is somewhat large and heavy and will require additional shipping charges. After placing your order you will be notified of the additional charges and be able to accept or reject them before your payment is processed. Thanks. Very Good . Santa Barbara:: Neville,. 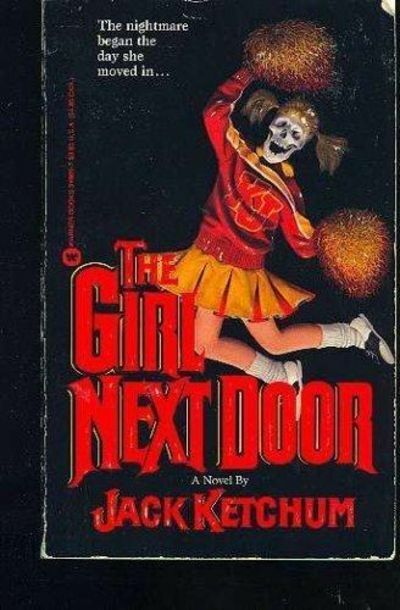 1989.. First edition. By Charles Willeford, who died before he could sign the edition, with an introduction by Burke. 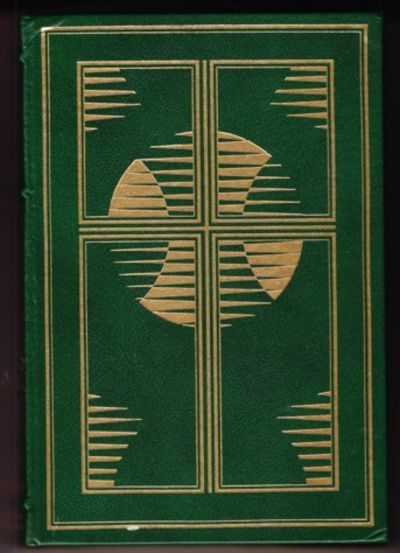 An out-of-series, unlettered copy in the same binding as the 26 lettered ones, SIGNED BY BURKE. Fine as issued, in full black leather with lettering and design stamped in gold (the lettered copies were the only copies so bound). .
New Haven : Privately printed ... by Robert Reid & Terry Berger at the Sign of the Gryphon, 1989. 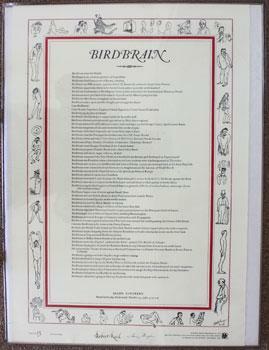 Broadside printed by Robert R. Reid and Terry Berger. 24 x 16.5 inches. Marginal illustrations by David Hechtlinger. Copy No. 13 of an undisclosed edition size. Signed in ink by the printers. Provenance: Peter Howard, Serendipity Books, Berkeley. Random House, 1989-01-01. Hardcover. Very Good. 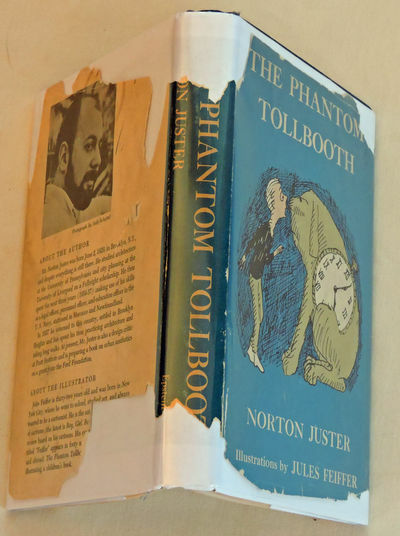 Book Condition: Very Good, though very lightly tanned; Blue cloth cover embossed in white on front cover with boy and dog nose to nose, the dog having a pocket watch on his side; spine is embossed with THE PHANTOM TOLLBOTH/ NORTON JUSTER/ Epstein & Carroll; front and rear endpapers contain a map, titled âÂ€ÂœThe Lands Beyond.âÂ€ÂDust Jacket: Poor, torn front and rear, and spine (parts missing), mylar covering; Photograph of author by Judy Scheftel; brief bios of author and illustrator.Used Hardcover; First Edition, First Printing (the dust jacket bears a photograph of Norton Juster);illustrations are pen and ink copies of originals, 256 pp 100% Satisfaction Guaranteed. All items are carefully enclosed with bubble wrap. We ship promptly and worldwide via US Post and will email you a tracking number. BOUCHARD. ANDELE (Vaclav) [pseudonyme de Thierry BOUCHARD]. Dans la perdition du nom. (Sept nouvelles icônes secrètes). BOUCHARD. ZADNY (Pavel) [Thierry BOUCHARD]. La neige : un souvenir de Matyas Bernard Braun + Sneh : spomienka na Matyasa Bernarda Brauna. Traduit du slovaque par Peter Brabenec. Avec une eau forte originale de Petr Herel. Child's Handkerchief published by Judd Street Gallery in 1989. 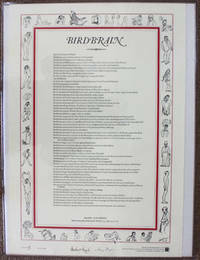 500 copies printed on 240g Rivoli Blanc paper, of which 200 are sold in sets with the cotton prints, and 300 separately. This is number 110 and is one of the 200 sets with the cotton printed handkerchief. 'Anne Ullmann, the artist's daughter , suggested this first publication of the handkerchief. The scanning, platemaking and printing was done by Adrian Lack at the Senecio press, Charlbury, Oxfordshire, and he successfully improvised a method for feeding cotton into a lithographic proofing press'. The handkerchief is inscribed 'To John' in the tiny oval between the figures 11 and 12. The dedicatee is John ravilious, eldest son of Eric and Tirzah Ravilious. The Print and the Handkerchief measure 43 x44 cm and both are in Fine condition protected by original tissue guards. Housed in the original Paper folder which has a cover based on a design by Ravilious. The cover is a little marked and stained to the rear plain blank cover. A very scarce Ravilious item and the first we have handled to date. 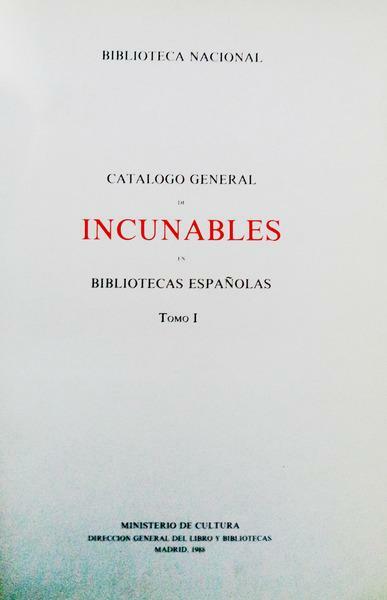 CATALOGO GENERAL DE INCUNABLES EN BIBLIOTECAS ESPAÑOLAS. 1989. First Edition . Signed. REAGAN, Ronald. Speaking My Mind. New York: Simon and Schuster, (1989). Tall octavo, original half blue cloth, original dust jacket. $3000.First trade edition of ReaganÂ’s selected speeches, inscribed on the dedication page: ""To Harty GardnerÂ—With Very Best Wishes. Ronald Reagan. 3/27-1990. 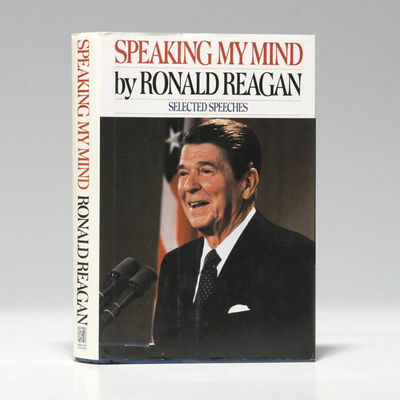 ""Selected and annotated by Reagan, this collection begins with one of his first public talks, delivered in 1951, and includes the many speeches that helped define the ""Reagan Revolution"" and his two terms in the White House. Published simultaneously with a signed limited edition of 5000 copies. Harty Gardner was the former treasurer at Mobil Oil Corporation.A fine inscribed copy.